First of the A.D. 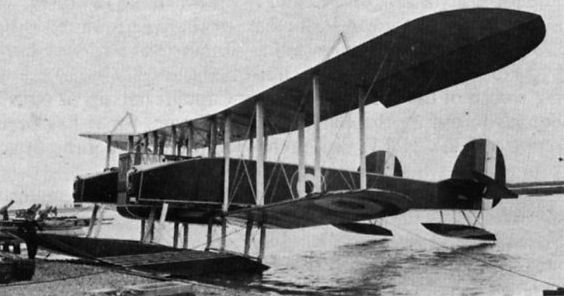 Type 1 seaplanes. No 1000, here seen with its engines removed. The second A.D. Type 1 to be laid down. No 1358, was the first to fly. This photograph clearly illustrates how the armour about the engines and radiators deprived the crew of any lateral view. MAJOR AND MINOR. Photographed on the maker's slipway (J. Samuel White & Co. Ltd. of Cowes. l.o.W.) in 1916 are two lesser-known naval prototypes: (left) the Air Dept. of the Admiralty A.D.1000 five-seat torpedo-bomber (serial 1358) and the White Baby single-seat scout (serial 9097). Three of the latter were built, but, like the 115-ft.-span A.D.1000, the 30-ft. 8-in.-span Baby was not operationally successful. The twin-boom A.D.1000 had two tractor (and one pusher) 3 10-h.p. Sunbeams, while the Baby had a 100-h.p. Gnome Monosoupape rotary.